Two years ago, my friend`s daughter graduated from High School here in Finland. He is a Scot but A. does not have his own tartan and B. does not have a kilt. 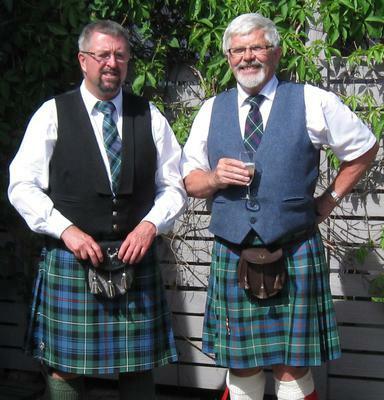 I had just bought a new kilt, ancient MacKenzie, so I offered my old one, but no he wanted my new one, with the result I had to wear my old one which was a bit small, as you can see in the photo I am on the right, it did not sit quite right. His on the other hand was perfect. However we managed to survive the day. My son intends to marry next year in Thailand so I sent my (old kilt) to Glasgow ,to be shortened, new lining , and cleaned, with the result it looks great and will probably last another 40 years or so. At least we can take time to buy all the other bits and bobs I may travel to Thailand (if )I am invited, needless to say I will wear my kilt there. I wonder what the law says about wearing a sgian dubh in Thailand? the plane might be fun to get through security. Here in Finland one gets a sideways look and a wee smile, but no comments, or not many anyway, they are too polite to say anything. As the owner of the website I would caution Mike to be very careful when wearing his Sgian Dubh abroad, I personally have been stoped by police in London and told that it would be advisable not to wear it in public, even though they accepted it as part of my National Dress. So do please check with the local police first.